Crews Battle 3-Alarm Fire at Mansion in Southborough, Mass. 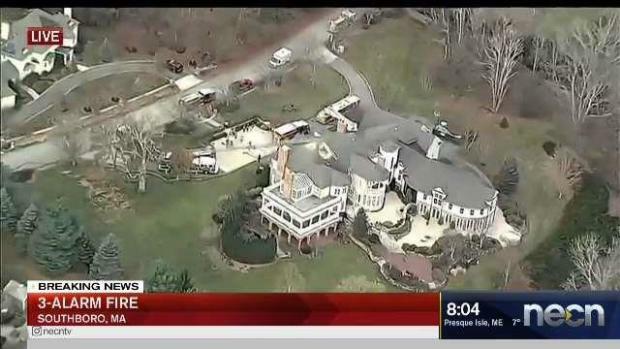 Fire officials are trying to determine what caused a 3-alarm blaze at a mansion in Southborough, Massachusetts. The blaze was reported shortly after 7 a.m. Thursday near the area of 7 Wyndemere Drive. Fire officials said the flames started in a second-story bedroom and spread. Authorities said it was the size of the house that posed a challenge for firefighters. "The challenge is that it's a very large house and we have a limited number of staffing on duty so the crews did a great job initially coming in and knocking the fire down," said Southborough Fire Chief Joseph Mauro. "It's got an attic with a lot of insulation in there so that was the big concern—making sure the fire was knocked down before any damage spread to the rest of the house." 3-Alarm Blaze Chars Home in Southborough, Mass. Firefighters responded to a 3-alarm blaze at a residence in Southborough, Massachusetts. Authorities said the homeowners, who just moved in a few weeks ago, made it out safely and were not hurt. Despite some damage, the fire does not appear to be suspicious.